Planning for affordable housing is challenged by development policies that assess transportation impacts based on methodologies that often do not distinguish between the travel patterns of residents of market-rate housing and those living in affordable units. Given the public goals of providing affordable housing in areas with good accessibility and transportation options, there is a need to reduce unnecessary costs imposed by the potential overestimation of automobile travel and its associated impacts. Thus, the primary objective of this paper is to examine and quantify the influences of urban characteristics, residential housing type, and income on metrics commonly used to assess the transportation impacts of new development, namely total home-based trips and home-based vehicle trips. Using the 2010-2012 California Household Travel Survey, we regressed these metrics on urban place type, regionally adjusted income, and housing type, controlling for household size, weekday travel, and home location. The results indicate significant reductions in vehicle trip making with lower incomes and increasing urbanization. These findings support more differentiation of affordable and market-rate housing in the development review process and emphasize the need for development standards to be more sensitive to the characteristics of future residents and location. Howell, A., Currans, K., Gehrke, S., Norton, G., & Clifton, K. (2018). 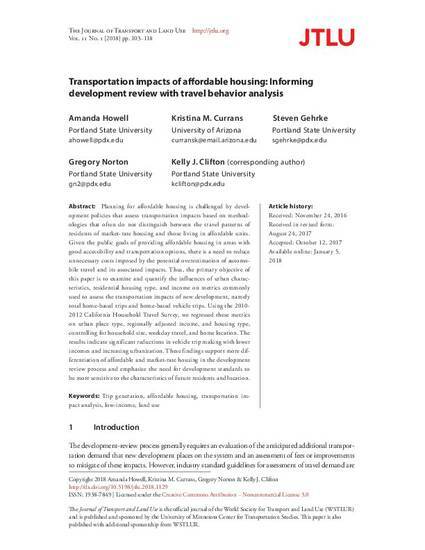 Transportation impacts of affordable housing: Informing development review with travel behavior analysis. Journal of Transport and Land Use, 11(1).